A dozen leading exiled Burmese media groups have called for government censorship to be lifted and publications both inside and outside the country to cooperate for greater press freedom during a landmark conference. 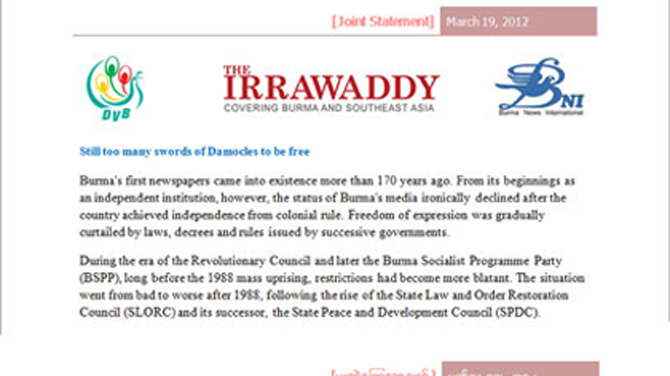 The joint statement by The Irrawaddy, Democratic Voice of Burma and the Burma News International network is entitled “Still too many swords of Damocles to be free” and calls for experienced Burmese and foreign industry figures to be involved in drafting new media legislation. Representatives of domestic and international media organizations meet with Burmese officials in Rangoon on Monday and Tuesday for a conference organized by the Ministry of Information, UNESCO, International Media Support and Canal France International. “It is important that the media law in Burma/Myanmar should not only focus on freedom of the press and freedom of expression, but also constitute a safeguard for the security and rights of members of the media community,” says the joint statement. “It is also imperative that the role of both national and ethnic media be taken into consideration, given the paramount need to resolve the issues of civil war and the right of self-determination, in order to forge national reconciliation and peaceful co-existence among the diverse peoples of the country. The joint statement calls for five key points in order to ensure a healthy and thriving media landscape in the Southeast Asian nation—Independent figures involved in drafting media law, current censorship must be stopped, a united voice for exiled and internal Burmese media, increased ethnic coverage and continued support for diaspora publications. “We take note of the fact that the present government is making efforts for the emergence of a new media law and that there has been a conditional relaxation of some of the restrictive laws,” the statement says. “However, it should not be forgotten that our country still ranks among the worst in the world when it comes to press freedom. Burma News International is comprised of 10 members—Mizzima News, Narinjara News, Kaladan Press, Karen Information Center, Khonumthung News, Network Media Group, Independent Mon News Agency, Shan Herald Agency for News, Kao Wao News, Kantarawaddy Times and Kachin News Group. Burma's first newspapers came into existence more than 170 years ago. From its beginnings as an independent institution, the status of Burma's media ironically declined after the country achieved independence from colonial rule. Freedom of expression was gradually curtailed by laws, decrees and rules issued by successive governments. During the era of the Revolutionary Council and later the Burma Socialist Programme Party, long before the 1988 mass uprisings, restrictions became more pronounced. The situation turned from bad to worse after 1988, following the rise of the State Law and Order Restoration Council and its successor, the State Peace and Development Council (SPDC). In the wake of the 2007 Saffron Revolution, when information technology was increasingly used to disseminate information, the SPDC enacted the notorious Electronics Act. This draconian law was used to impose harsh prison sentences on those who use electronic media to expose the regime's ruthless crackdown on protesters. Ko Aung Zaw, Ko Soe Myint and Ko Aung Naing along with BNI partners should be awareded for 'freedom of the press' prize by Daw Suu. Press Freedom is our mission. We could recruint 30-50 new Journalsits and skilled reporters in 2015 if we are united. Burma has over 400000 solders, but less then 400 journalist. Burma has over 50 million populations,but less than 50 FM radio stations. Burma has over 20 reading and writing languages, but less than 3 major newspaper other than Burmese. If we are untied, in 2020, we could station in all major city like AFP and BBC. "Mizzima News, Narinjara News, Kaladan Press, Karen Information Center, Khonumthung News, Network Media Group, Independent Mon News Agency, Shan Herald Agency for News, Kao Wao News, Kantarawaddy Times and Kachin News Group" - a hundred flowers truly blossoming that must make us all proud, but alas and to our shame not on our native soil. Let us all look forward to that day when they can proudly represent our free media in all our splendid diversity.